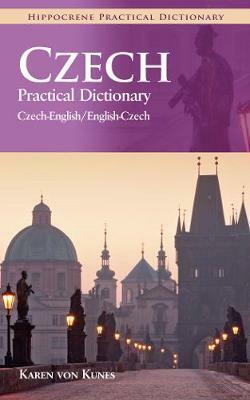 This dictionary contains approximately 30,000 entries in Czech and will be very useful to all learners of Czech. The focus is on practical, everyday vocabulary, rather than literary language. The target audience of this dictionary are English-speaking learners of Czech, rather than Czech-speaking learners of English. The vocabulary section is preceded by a concise introduction to the Czech grammar and covers verb conjugation and adjective/noun declension. The Czech orthography is phonetic. Generally, the letters are pronounced in the same way, regardless of their position in a word. The author explains in a very accessible way how to pronounce all letters of the Czech alphabet. In the Czech-English part of the dictionary, noun entries include the gender information, the genitive case ending and an indication of the hardness or softness of the noun. Verb entries appear in their infinitive form, followed by their first person ending in the present tense. The author, Karen von Kunes, is an expert on the Czech language and culture. She’s a lecturer at Yale University.